Fog Season (2019. 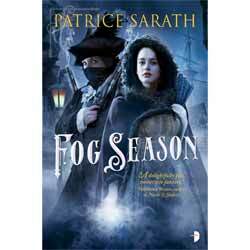 346 pages) is the second book in the Tales of Port Frey series, written by Patrice Sarath. The book follows on from the story in The Sisters Mederos. I wasn’t sure what I was expecting from the novel, the cover suggested many things which, personally, do not interest me. However, this is a case where you cannot judge the book by the cover. We follow Yvienne and Tesara as our POV characters and for much of the book the sisters are separated. Yvienne is the stronger of the two and has a fierce reputation as being extremely intelligent, both in her private life and in business. At the beginning of the book their parents set sail following a rumour that one of their last surviving ships may yet be afloat. A merchant House is not really a going concern if they have no ships of their own and unbeknownst to anyone outside of the two ladies, the book confirms Tesara’s fears that her wild talent may have sunk their own fleet. With her father away Yvienne takes over the reigns of the business, unablely helped by her uncle, a well-meaning if unsophisticated old fella, a sort of uncle Billy Bailey character. The arrival of Abel puts Yvienne on the defensive as her paramount driving force is to protect her sister. Tesara, on the other hand, is a bit of a drifter. Society lady during the day, she frequents gambling houses at night, winning sums of money that keep her Merchant House afloat. Of course, no one likes success and her ability to read cards is often met with ire from other players, or with her being banned from establishments. Tesara also has a secret, she is an unnatural. She can project electrical force through her hands, useful, but also the sort of thing which will get you burned as a witch. There is nothing at all witchy about either of the two women, where I was expecting a bit of a bodice ripper of a story which provided the female characters with a disproportionate amount of power over their male dominated culture, Sarath has instead chosen to portray women who are strong through the strength of their character. Tesara’s powers are more like a mutant, a proto Storm, if you like, and during the story she uses it little, its main function is as an ex machina, to either get her into or out of trouble. Few of the male characters are portrayed as anything other than pompous and far less able than the two sisters, except Abel. Abel is an interesting character in his own right, as the story slowly peels away at his tragic past, his enforced loyalties, it all point towards a much bigger world of unnatural’s, which, hopefully Sarath will expand upon in later novels. Well written and tautly paced the book provides a very enjoyable historical thriller. Well worth a look.